Heat oven to 400°F. Spray bottom of 9-inch square pan with cooking spray or grease with shortening. Stir Bisquick mix, cornmeal, sugar, salt, milk, oil and eggs in medium bowl just until moistened. Gently stir in remaining ingredients. Pour into pan. For a full flavor kick, substitute jalapeños for the green chiles and use an equal amount of Monterey Jack cheese with jalapeño peppers for the Cheddar. Cut this bread into unusual shapes with cookie cutters, then serve with chili or top with honey butter. Do you like your food extra spicy? 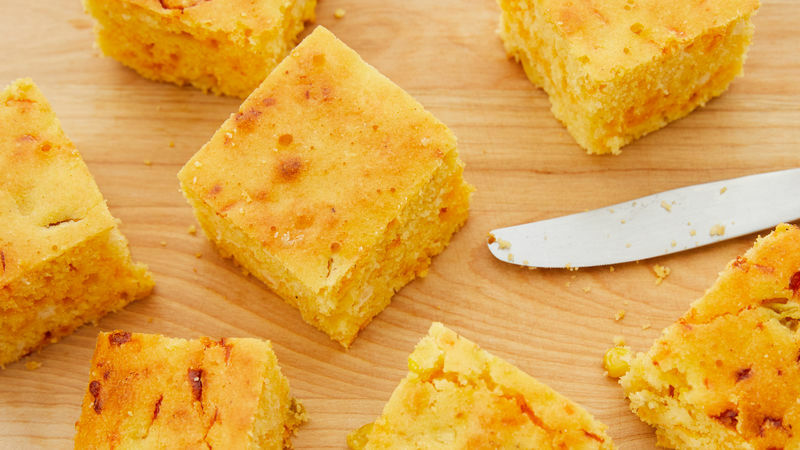 Add heat to this already-spicy cornbread by replacing the Cheddar with an equal amount of pepper Jack cheese.